You know that programme that used to be on BBC2, "Can't Cook, Won't Cook"? I'm sure that was named with me in mind. 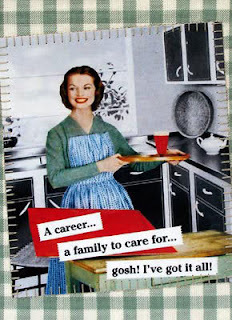 My mother was seriously hampered by her asthmatic condition but always wanted to fulfil her role of "homemaker" to the max by doing as much as she could, then asking for help. Suffice to say, my sister and I did the "heavy jobs" (the hoovering, the dusting, cleaning the inside of the car) to earn our pocket money and mum carried on doing what she was good at. When I left home, in a blaze of glory, at the age of 18, I didn't know I couldn't cook until it came to actually feeding myself and not actually buying the food from a take-away or having it placed in front of me ready plated. On the other hand, my boyfriend (now my long-suffering husband) was a dab hand in the kitchen. He and his brother used to come home from school and start preparing the evening meal for when their parents came home from work. "So, Nic, what shall we make for tea?" "Oh I don't know, love. How about a fried egg butty?" "Kev, how do you switch the cooker on?" "Why, love? Isn't it working?" "No. I can't see where the little flames would come from"
"What little flames? It's an electric cooker!" "What did you make at home?" "Nothing. Mum always used to make the tea." "Well, what sort of cooker did you have?" "THE ONE WITH THE LITTLE FLAMES ON." So, that sort of set the precedent for the coming weeks. I would watch whilst he would cobble something together and eventually I learnt how to cook the basics. Now, my Yorkshire Puddings are legendary and I've managed keep my family alive for the past 18 years or so. I've not killed anyone. Yet! Kev also completed a basic chefs course at college in the mid 1990's and now makes the most fabulous pastry!! In his role as the at-home parent, he always has a meal waiting for me on my return from work from Monday to Thursday (Friday is usually take-away day). I'm quite happy for him to have control of the kitchen as I still detest the science of cooking but I enjoy preparing and serving a Sunday roast each week. My daughter had cooking lessons as part of her accommodation contract when she lived in the hostel so she's fairly competent now, son #1 is, shamefully, following in my footsteps - he would happily live off beans on toast and cereal for the rest of his life - whereas son #2 loves baking and has progressed onto making scrambled eggs for everyone when we have sausage and bacon. Does everyone in your house join in with the cooking or has someone marked their territory?